Karen Pryor Academy (KPA) and Guide Dogs for the Blind (GDB) are well-established and well-respected entities within the canine and training worlds. Connected already through Michele Pouliot, GDB Research and Development Director and KPA/ClickerExpo faculty member, the two organizations have created a new and exciting collaboration. In a pilot program conceived by Michele Pouliot in the summer of 2013 and implemented in late 2013 and 2014, KPA Certified Training Partners (CTP) have become puppy raisers for GDB. Michele and GDB are currently in the middle (year two) of a five-year training transition program. 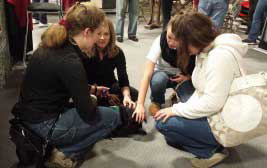 Although GDB pioneered the adoption of clicker training within the organization all the way back in 2005/2006 (and a small test program concluded that clicker trained puppies had higher “graduation rates” to full guide dog status than others), the full training shift to all departments from traditional to positive training has been a huge multi-year project requiring time, patience, and step-by-step goals. But this expansion to a more positive and less stressful training experience for both dogs and humans has been validated by the clear evidence that changes in both the world environment and in visually impaired clients required adaptation. As the rollover to positive reinforcement training moved ahead steadily at GDB, Michele wondered if “picking the brains” of KPA colleagues, seeking the advice of skilled and knowledgeable trainers, would help GDB adapt its proven program. Her approach to Karen Pryor, CEO, and Aaron Clayton, President, at Karen Pryor Clicker Training with the idea of using experienced and certified trainers was well received. KPA Certified Training Partners who were long associated with KPA and committed to Premium Membership and the Academy’s high standards were recruited through the KPA Resource Center and selected after completing the standard GDB puppy raiser application. While only seven KPA trainers are currently working with GDB puppies, two more have applied to join the program and the overall response to the invitation was solid and positive. Many KPA CTPs, with multi-animal households or with high-maintenance animals already in their homes, did not feel that they had the best environment to offer at the time. The ultimate goal of this partnership is to research and identify positive reinforcement techniques effective in the raising and development of guide dog puppies via KPA CTP. With the end-goals in mind, KPA CTPs work independently from GDB with none of the standard requirements GDB puppy raisers usually have, such as leaders, participating in a group, or attending meetings. In exchange, GDB requests documentation (both written and video) of the creative training processes and techniques used for behaviors. Michele and others at GDB have made it clear that they are interested in both the successes and the challenges of the puppy raising experience. 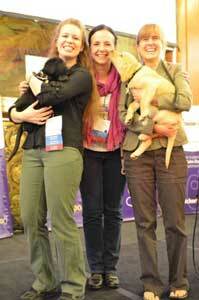 While one lucky puppy was the first to be matched to a KPA CTP in September, 2013, the official launch of the collaboration was held at the end of the first ClickerExpo conference of 2014, in Long Beach, California. Appropriately enough, that ClickerExpo was held at the (docked) art-deco luxury liner The Queen Mary. In a special ceremony, Laura VanArendonk Baugh, Gure Garmendia, and Scotti Harvey, all KPA CTPs, received their 8-to-10-week-old puppies. While the trainers knew they would receive their puppies at that moment, the puppies had only been identified to them as Labradors and referred to by the first initial of their names—until the big reveal. And six month later… how are the puppies and their KPA CTP trainers doing? The trainer/dog matches are all in the middle of their training periods. With the first puppy due back to GDB late fall 2014, others will not be finished their introductory year-plus until February 2015 or later, depending on each dog’s readiness and GDB’s assessment of the puppy raising achievements, of course. Meet Luke and Mindy—and Laura, Gure, and Scotti! Luke and Mindy are the two puppies that were placed in their trainers’ care at ClickerExpo. Luke (a yellow Lab) is being co-raised by Gure Garmendia and Scotti Harvey in the state of Washington. Mindy (a black Lab) is paired with Laura VanArendonk Baugh in Indiana. Luke and Mindy are definitely cute puppies, but both are developing into successful learners and reliable workers as well. Their KPA trainers are on their way to meeting the challenge of raising a valuable and essential guide dog for a visually impaired person. Gure, who lives in the city of Seattle, and Scotti, who lives on Bainbridge Island, were friends before they undertook to co-raise Luke. Each of them had been interested in the opportunity to be involved in the pilot collaboration between KPA and GDB. With busy lives, they had, regretfully, dismissed the opportunity individually until it came up in conversation between them. Gure says, “I don’t know if it was me getting Scotti ‘in trouble’ or the other way around!” Regardless of who convinced whom, after considering and eliminating the idea of raising two puppies, Gure and Scotti agreed to train a GDB puppy together. Their application for “joint custody” was approved. As Michele Pouliot points out, “Co-raising takes some pressure off.” Not only do Gure and Scotti split the care, time, expenses, and responsibilities of puppy raising, but guide-dog-in-training Luke experiences more social exposures than he might otherwise. He also learns to adapt as he travels between homes. (In fact, the ferry ride between Scotti’s and Gure’s homes has been an excellent site for training sessions!) With two attentive trainers, co-raising a guide puppy can be an excellent approach. Scotti has been involved with clicker training for many years, and has worked with Terry Ryan in the KPA Dog Trainer International program after completing the program in the US herself. An experienced trainer, Scotti was eager for the challenge of a GDB service dog and excited to work independently as part of a pilot program. When Luke is with Scotti, his home environment is rural. Scotti lives and runs her training business on a farm called Runamuck Ranch that also houses an elementary school. With animals and children around, Luke has had many opportunities to build relationships, a focus of Scotti’s training. Gure lives in the urban setting of Seattle and has small children of her own. (Both Scotti and Gure have an ever-changing family of dogs, too, so Luke has had many canine pals at his homes.) A clicker training fan since she first observed it in a park in Montreal in 1994, Gure read, studied, and started teaching her first kindergarten class in 1998. She completed the KPA Dog Trainer Professional program in 2012. She says, “I thought I was a good clicker trainer, but I was humbled when I took the KPA course. 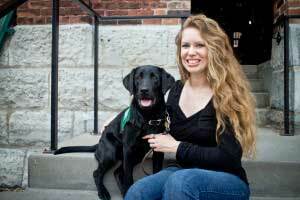 There is always more to learn!” A puppy specialist, Gure had never worked with a service dog until Luke. Scotti says, “Gure and I each have our own relationship with Luke, and our own style of training.” Yet before Luke came to Gure and Scotti, they sat down with their calendars and the GDB list of goal behaviors and began to map out their shared training. They considered who and where would be best for each exposure or behavior that Luke had to learn. This loose framework and the plans they made pre-Luke have had to be adaptable, of course. In fact, for the one period where both Gure and Scotti had conflicts, a third KPA CTP friend, Molly Timko, was able to step in and care for Luke for a week, maintaining his training. On average, Luke is at one household for a week or a week and a half. There have been longer and shorter stretches, however, and the two trainers are always flexible. Gure and Scotti are in regular contact through conversation and e-mail, and are committed to sharing progress, concerns, and other significant information when they meet to exchange Luke. The two trainers decided early on to train Luke to sleep in a crate, giving the puppy that same experience and consistency in both homes from day one. Both Scotti and Gure have also trained the “That’s enough” behavior with Luke. “That’s enough” both interrupts what is occurring and redirects Luke’s attention to the trainer. Overall, Gure calls his transitions “seamless.” Luke loves to come and go, and he loves all members of his families. His back-and-forth may be good preparation for leaving Gure and Scotti and heading back for GDB formal training, as well as his ultimate placement with a visually impaired person. 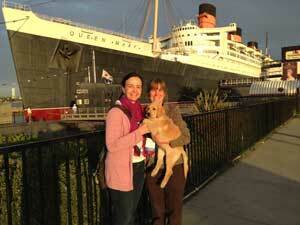 Like Gure and Scotti, Laura was interested in the call for KPA CTP volunteers to partner with GDB puppies. She discussed the idea briefly with her husband, but they decided against the pilot program as they had two Dobermans in their home already, both ailing. Sadly, Laura’s dogs died, one in late 2013 and the other in early 2014. 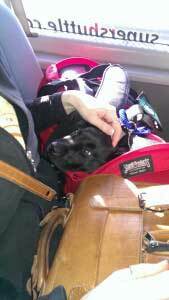 In her suddenly dog-less household, Laura reconsidered the KPA/GDB program and jumped aboard. She calls her puppy an interim dog given the natural timing. While Laura works with a GDB puppy, preparing for the dog’s vital work ahead, she can think through the addition of her next “forever” dog. It was only two weeks after her second dog’s death that Laura met Mindy at ClickerExpo in California. Still mourning her own dogs, and participating fully in ClickerExpo, Laura took on the responsibility of her GDB puppy—and the task of transporting Mindy home to Indiana. As Laura acknowledged in her blog, it was a challenge “…traveling for hours in a crowded plane with a puppy who barely knew me!” Laura and Mindy made it home to Indiana intact, only to face Indiana winter—and a 70-degree drop in temperature from the ClickerExpo location in California! Although she has not raised a service dog before, Laura is working well with Mindy, turning the GDB behavior list into everyday training. Mindy is learning all about daily life and learning predictable, socially acceptable behavior. In her early days and weeks at home with Laura in Indiana the way that Mindy caught on to clicker training was impressive. Laura and Mindy’s second outing turned out to have more stimulation than Laura had expected in terms of crowds, smells, and wait time, yet Mindy was focused on Laura and the possibility of treats! Laura finds Labrador Mindy calmer than her previous Dobermans; Mindy is definitely more accepting of water and baths than Laura’s other dogs were! Laura says that for Mindy, the hardest lesson so far has been to refrain from greeting everyone when Laura and Mindy are out training. All KPA CTP puppy raisers, including Laura, Gure, and Scotti, provide monthly progress reports to GDB, sharing all aspects of their training. The reports become part of their dogs’ permanent record, but also are transformed into primary source material for evaluating the collaboration. The reports can be written, but video is also requested and is considered most helpful. As Michele Pouliot says, “There cannot be too much video!” Roughly halfway through the pilot project, Michele calls the video she has seen impressive and is eager for more. Scotti says that one training topic about which she has shared video is Luke’s interaction with her vacuum. Luke had been fine with the vacuum, but then one day he showed concern. He was conflicted about it moving around him, so Scotti implemented an impromptu training session immediately. That day Scotti and Luke did three training sessions with the vacuum, and Luke progressed quickly. In fact, he got to the stage where he could participate in a full training session focused on other behaviors while the vacuum was running nearby! When Luke decided to have a play fest where Scotti was vacuuming, she caught it on tape to share. Laura has shared video from the very early days in Indiana up through a recent spurt of traveling. The trainers say that it is sometimes hard to obtain video of important training sessions (forgetting the camera, no one around to assist, etc. ), but they try hard to accumulate this valuable documentation to share. The opportunity to evaluate all of the feedback from the KPA puppy raisers through their journeys with a GDB puppy is priceless. Ultimately, these reports will be an integral part of the assessment of the pilot program, and a basis for making adjustments to the GDB puppy raiser training transition plan. The many different strategies, opinions, and creative training methods that the KPA trainers can try and then supply data for are important contributions to the future of positive training in the service dog field. The KPA/GDB collaboration is a pilot program, something that is a plus for raisers Gure, Scotti, and Laura. While it is exciting to be the “pioneers,” it is correspondingly difficult to blaze the trail. Purposely, the trainers have been provided just the bare bones of what they need to do (the GDB expected behavior document) and given free rein to complete the assignment. Carte blanche means complete discretion, after all. In order to foster as many creative training strategies and inventive training tips as possible, very little direction has been offered. Of course, GDB personnel have been, are, and will be accessible to KPA puppy raisers. 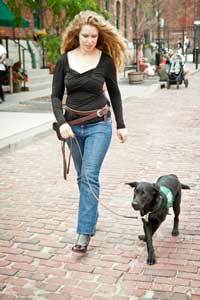 Pat Cook, Guide Dogs for the Blind Community Resources Manager, is the primary contact for the KPA raisers. Michele Pouliot is another resource. Laura reports that she does not “feel lost” and that her questions are answered. “I’m sure there would be more answers if I had more questions,” she says. Another source of support that is developing as the pilot program moves ahead is the community of KPA puppy raisers themselves. The group has created their own Facebook page where ideas, suggestions, and encouragement are shared. As the trainer(s)/dog matches move into the second half of their training periods, the page is becoming more popular and used more often. Scotti, calling the KPA puppy raisers “an inviting and nice group” believes that the support from the page will only increase as more trainers share different stages of their experience. Gure shared a video about how she taught Luke not to bark when her other dogs barked—just to show her strategy in dealing with that behavior (even though it is not on “final goal list”). She received help from the group when she shared a video about food impulse control in an Emergency Room. One of the other trainers noticed that Luke was taking treats a little hard. He was, and Gure was able to address that issue! The value of co-raising, if it is feasible, has become apparent to all of the KPA raisers, those co-raising and those working alone. With the potential for twice as many interactions and exposures, the dogs benefit. With the ready availability of backup and support from similarly minded trainers, the raisers are less likely to feel overwhelmed or at sea in any way. Midpoint check: any big issue so far? Happily, there have been few hiccups and no insurmountable obstacles to interrupt or slow the KPA/GDB collaboration. However, one area that was identified as a potential sticking point/trouble spot even before the pilot took off has in fact been a challenge. Clicker trainers often use food as a treat or reward, and many clicker trainers toss treats to a dog in training. Whether it is to make it easier for the trainer or to set up a location where the trainer wants the dog to be next, tossing treats to the ground is quite common. As GDB policy/protocol has always been to feed by hand, Michele Pouliot was concerned about this conflict in food delivery systems early on in the collaboration. Dogs are trained by GDB trainers to accept food only by hand and only from their handlers; the tendency for clicker trainers to toss food was a significant difference. Blind handlers can only control food rewards by delivering directly to their guide dogs’ mouths. Since guide dogs for visually impaired partners have to learn to ignore food in their environment, focusing solely on what food is offered by the handler, how would the KPA puppy raisers transition from food dropping to hand feeding? While the KPA trainers have faced challenges in transitioning from food tossing to training the behavior “take food gently from hand,” they are succeeding. The dogs are learning that in their work environments they must eat only what is offered by hand by the handler. The KPA puppy raisers’ involvement in guide dog training has been a special education opportunity, especially for Laura and Gure who had not raised service dogs previously. Gure has found that there are many others in the Seattle area who are puppy raisers and part of service dog training groups, but the nature of the commitment to the pilot program separates her from that community a bit. Laura has been amazed at what she and Mindy have encountered in public when they are out and about. Despite the appearance of more and more service dogs, working with people with a myriad of disabilities across the country, there are still many people who are not attuned to the needs of a working service dog. Whether she is facing a genuine lack of knowledge or a negative or disrespectful attitude, Laura has had her hands full educating people who approach Mindy, or who let their children do so. She is firm in her belief that the equipment a service dog employs (primarily a service vest that clearly explains the dog’s role) requires the respect and distance other medical equipment, such as crutches, a wheelchair, or an oxygen tank, would demand. Laura works hard to explain this to people who want to pet, pick up, block, or otherwise interfere with Mindy, protecting Mindy and her training progress. She points out that there is now an additional expectation of Mindy: the dog will have to learn to deal with the approach of these people on her own. The proud trainers are eager to move forward with their service puppies. Scotti and Gure believe that “Luke is on track for developing the desired ‘intelligent disobedience’ required of a service dog.” If you consider intelligent disobedience as a doctoral level skill, Luke is still at the elementary school level, however, Gure and Scotti report. Luke’s trainers hope he will get to that higher level. They believe that his chances are strong since Luke is not afraid of being wrong, having been trained without punishment. Laura reports that at 8 months old, Mindy is now “rehearsing many behaviors and not just learning.” The behaviors she is rehearsing require fewer treats and clicks. Laura already sees an awareness in Mindy that she is “on the job” when her training vest comes out. Michele Pouliot at GDB marvels at how many more ways GDB has discovered to use clicker training since its simple introduction to the organization in 2005/2006. She is eager to see what comes out of the training within the KPA/GDB collaboration. How will the organization be able to expand the use of positive reinforcement training within their puppy raising program, a program that relies on hundreds of volunteers, most of whom have no training experience and many of whom may not even have dog ownership experience? While GDB may not be ready yet for all of what emerges from the KPA raisers’ experiences, the organization is always looking ahead. KPA puppy raisers will, of course, be valuable resources moving forward. The collaboration of KPA and GDB in a new puppy raising approach is both flattering and valuable to each of the partners, and emphasizes how positive training has become more appreciated and respected in the service dog world. The partnership provides a perfect platform to explain and educate about clicker training and service dog training. Laura (and Mindy) once conducted an impromptu class about the melding of the training at a home show they attended! Laura calls the mix of clicker training with guide dog preparation “the best possible example of the seriousness of clicker training.” Clicker training is used for vital, even life and death, tasks—not just for family pets and tricks. Not only is positive reinforcement in current use, but its possibilities continue to explode. Perhaps some of the KPA puppy raisers will continue to play a role in the service dog field, taking on another dog or working to educate the public. All will continue to expand the benefits of clicker training of course. Look for an update, and maybe some conclusions or next steps, next fall or winter as the KPA/GDB collaboration winds down.